This time of the year, I'm fortunate to live where I do. Though we did get to see Silverlox in the Snow last winter (Silverlox is what we call our property), the temperatures don't dip too low, and we very rarely see snow, sleet, or any other frozen precipitation. Of course, the other side of the coin is that we endure blazing hot and humid summers. 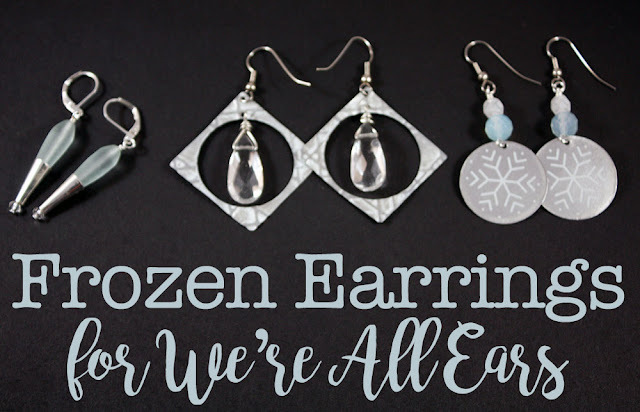 While I don't have a lot of experience with it, the We're All Earrings Challenge Theme this month from Earrings Everyday was Frozen. I considered taking my inspiration from the Disney movie, but that seemed too juvenile. 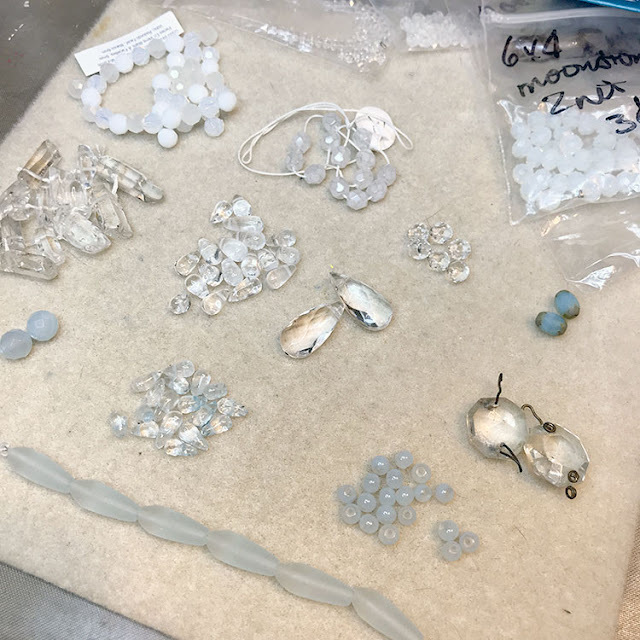 Instead, I pulled out a collection of clear, white, and light blue beads to get my creativity sparked. 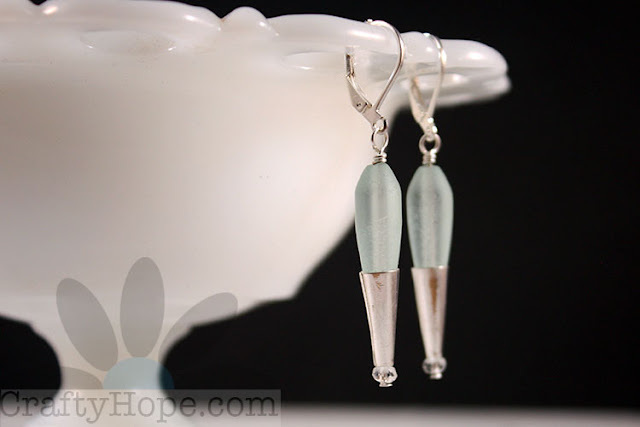 After discovering some silver cone bead caps, I realized that the light blue cultured sea glass beads would fit right inside them. With the cones on the beads, they looked like icicles. I added a small Chinese crystal bead below the cones to keep them from sliding off the head pin. It makes it look like the icicle is melting. And, the tiny crystal is just a drop of water sliding off. With so many beads assembled on my bead mat, I had a hard time deciding on my next direction. 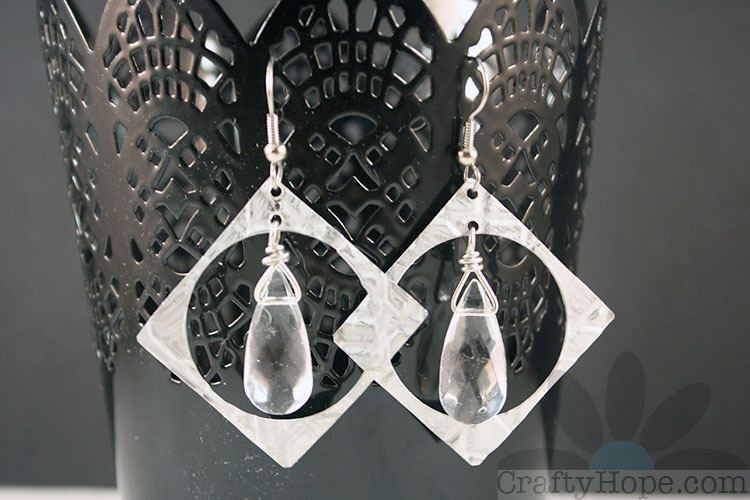 I liked the idea of using the clear elongated faceted teardrops, but how? My thoughts turned to tin and the idea of creating a frosted window of some sort. 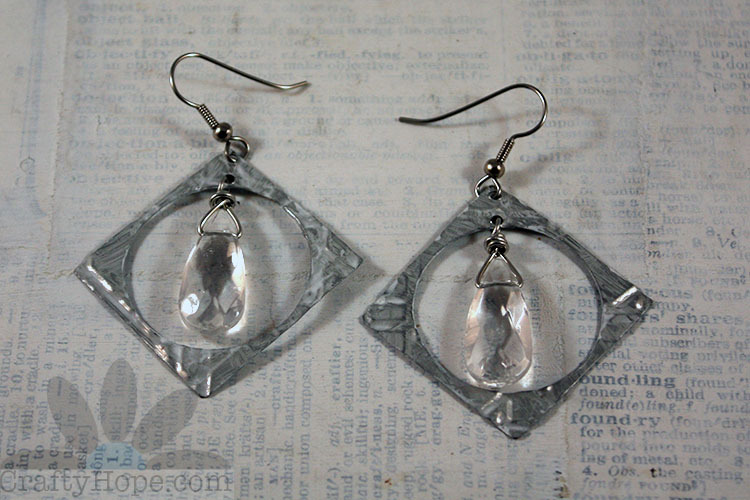 I started by punching holes that were large enough for the crystals to hang, then cut the squares around them. The tin was textured with an embossing folder to give the feel of the spiderwebby ice crystallization on windowpanes. Then, small holes were punched for hanging the briolettes and the ear wires. From there, I colored the tin with a wash of marble Vintaj Patina. All the white and clear in these made them hard to photograph. And, the large hole gave them a flimsy feel that I'm not digging. But, the idea is there. While I was digging through my tins for ideas and inspiration, I discovered one that had snowflakes around it. That seemed like a no-brainer. I simply stacked a few a couple of frozen-looking beads on top of the tin discs I punched and called it a day. 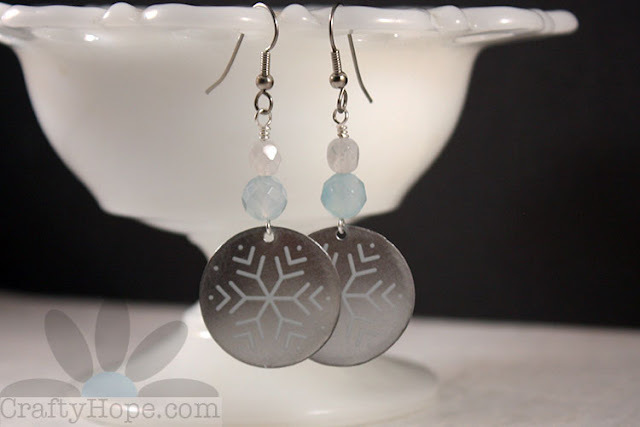 The white snowflakes on the silvery tin made these also hard to photograph. But, they're kinda perfect for this challenge. 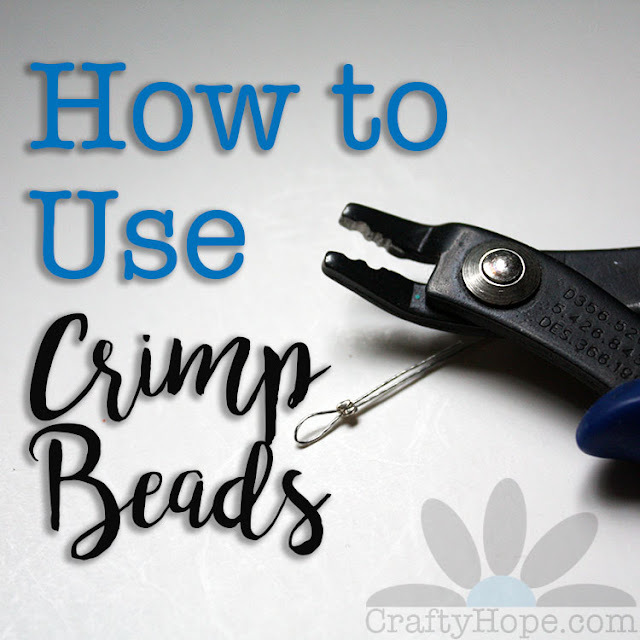 I really thought I would get more made with that pile of beads on my bead mat, but with a long list of other tasks, I made myself stop there. I think they all really work, but again, what do I know about frozen? 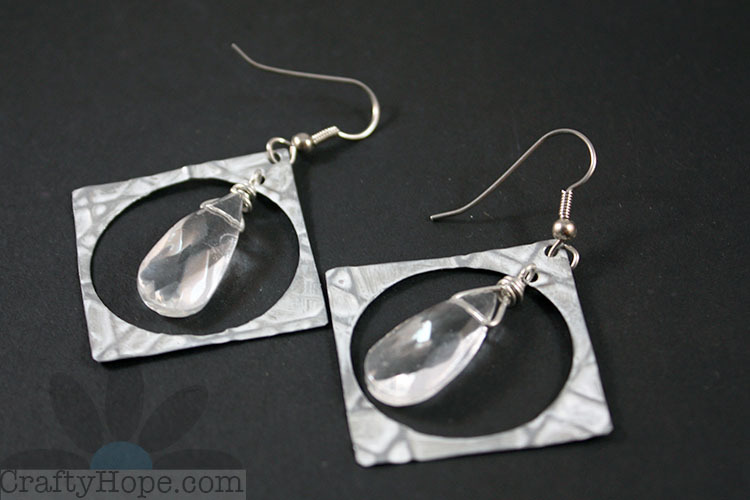 Make sure to head over to Earrings Everyday and see what Erin and any other designers created with this theme. I know I'm looking forward to it. Stay warm! 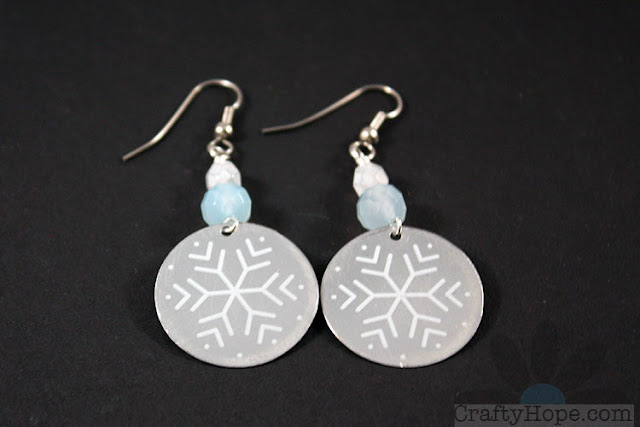 They are perfect winter designs! I love the tin windows you cut. Creative! Inspired indeed! Wonderful mix and match of materials, and I love your frosted window idea. I love how you figured out that the cultured sea glass beads would fit right inside the cones. My favorite pair is the middle pair. I love how you framed the beads. The last pair is wonderful. I love how you find those tins! Kathy, I think that was the benefit of pulling everything out onto my desk. 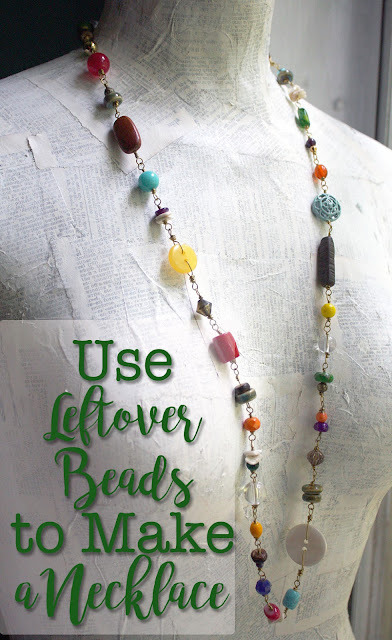 I was able to look at it all and figure out different ways to use the beads. 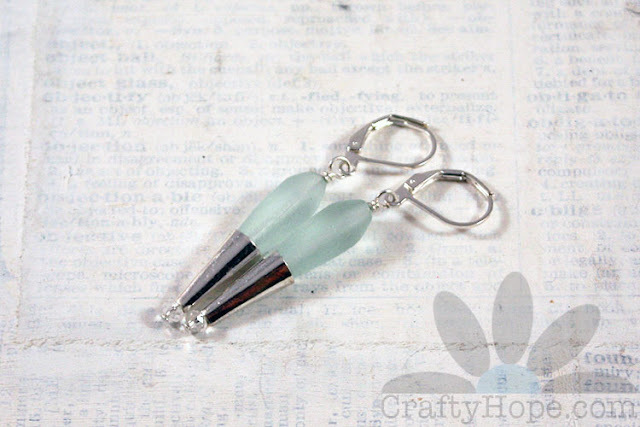 The sea glass fitting in the cones was serendipitous for sure! As for finding the tin...it helps when you just buy ALL THE TINS! Ha. Actually, I've made myself stop buying them all until I start using more of them. But, I always take a little time to pop in the thrift store and look. Thanks for popping by here! Ooh... I love how you turned those cultured sea glass teardrops the other way for a fantastic icicle effect! They are just lovely. As always you make me feel like finally attacking some of the tins that I've bought. Seriously, why am I so intimidated by them?? The last pair with the snowflakes is super fun. You may never get a white Christmas where you live, but you can bring your own snow!! 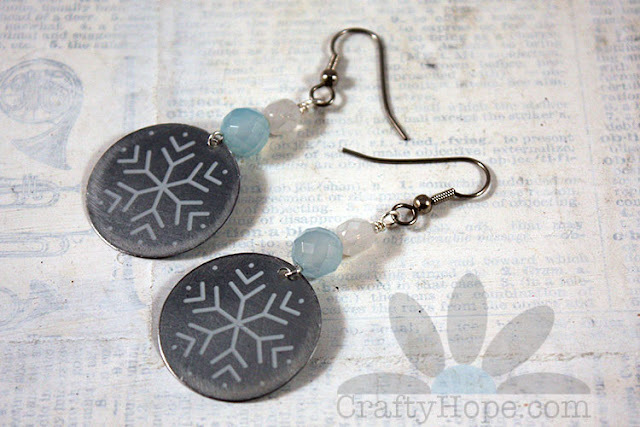 Wonderful frozen earring creations Hope! I love the snowflake ones, but I am certainly glad we rarely have to deal with the white stuff here...I put all my snowy decor away in mid January, hurry Spring! 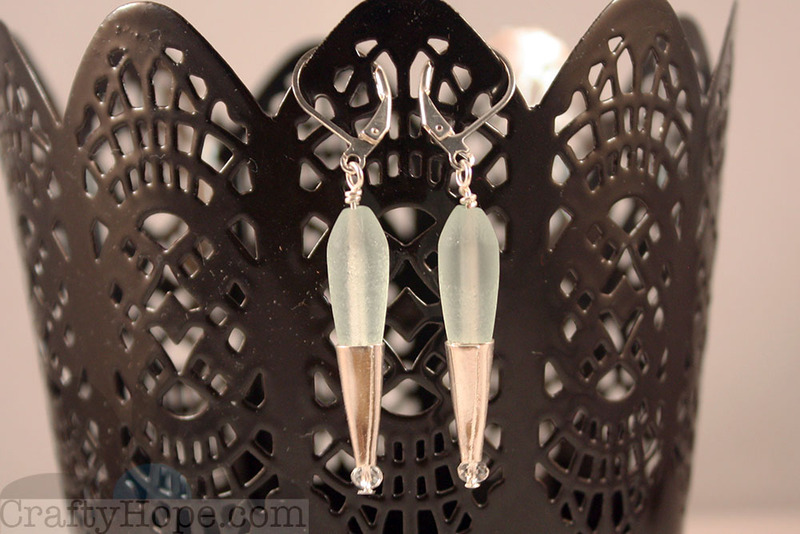 I love the coned drop bead earrings! Thank you! Those are my favorites too. I feel like the other two are just throw-aways, and that one's the real star. 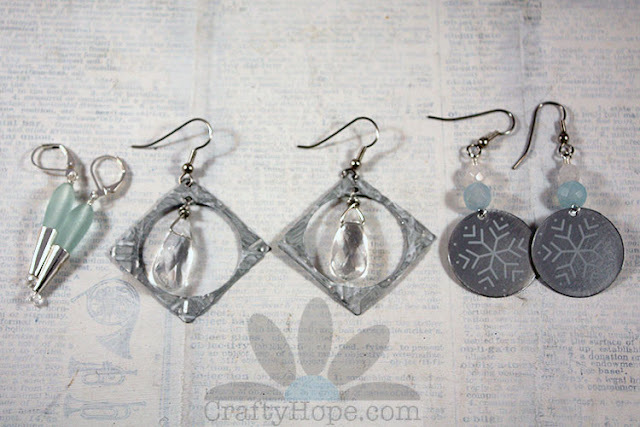 Hope love, love, love, the icicle earrings.